Tae Hoon Kim began his training in bioinformatics before the term even entered common usage. As a college intern in the early 1990s at the Smithsonian Institution’s National Museum of Natural History, he learned state-of-the-art computational methods for analyzing DNA sequences. His work contributed to a new understanding of evolutionary relationships among groups of plant species. Kim’s love of mathematics and interest in breaking down biological processes have led to trailblazing research in functional genomics, exploring forces that influence the regulation of genes across the human genome—and shape the myriad identities and behaviors of the body’s cells. His lab investigates the patterns and activities of sequence elements, such as insulators and enhancers, which serve as signals to control gene expression. In the process, they develop new experimental and computational tools, and gain insights into the mechanisms of cancer and other diseases. After attending Reed College in Portland, Oregon, Kim conducted doctoral research in biochemistry at Harvard University with Tom Maniatis (a 1978 Rita Allen Foundation Scholar). He helped to tease apart the workings of a protein complex, known as an “enhanceosome,” that acts as a genetic switch to control the expression of the interferon-beta gene—a critical factor in responses to viral infection. At the same time, Kim was excited by the progress of the Human Genome Project, and intrigued by the potential of genomics to shed light on genetic switches that operate at long distances from the genes they regulate. Together with a more senior graduate student, Bing Ren, Kim began “trying to figure out how to find these control elements outside the genes, in this [so-called] ‘junk DNA,’ that controlled the expression and regulation of their function.” Ren soon became a co-inventor of ChIP-on-chip, an approach for identifying protein binding sites across the genome that combines chromatin immunoprecipitation (“ChIP”) with DNA microarray technology (“chip“). Upon completing his Ph.D., Kim started a postdoctoral fellowship in Ren’s new laboratory at the University of California, San Diego. There, Kim led an effort to use ChIP-on-chip to map gene promoter sequences in human cells. He also contributed to the pilot phase of the ENCyclopedia Of DNA Elements (ENCODE) Project, which tested methods for identifying all functional elements in the human genome sequence. Kim joined the faculty of the Yale University School of Medicine in 2006, and became a Rita Allen Foundation Scholar the following year. 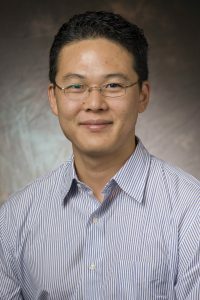 Having mapped the genome-wide binding sites for an “insulator” protein, CTCF, which plays a key role in delineating regions of active gene transcription from inactive regions, Kim and his research group investigated how CTCF functions in both mice and humans to regulate the expression of genes that control development. His lab also used genomic techniques to explore the underpinnings of a hereditary form of cancer, as well as the cancer-fighting capabilities of a class of drugs that interferes with the activation of oncogenes. In 2014 Kim moved to the University of Texas at Dallas, drawn by the opportunity to bolster genomics research on campus while broadening his interactions with students. Here, Kim expands on the relevance of his research to human health, the value and challenges of scientific collaborations, and the potential of new technologies to further illuminate the intricacies of gene regulation. Why is basic research on gene regulation important for understanding and treating diseases? Even with many advances in biomedical research, our basic knowledge of gene regulation is still incomplete. We continue to gain new insights into how the 2-meter-long human genome is packed and organized within the nucleus of each cell. For example, recent studies have shown for the first time that a process of liquid phase separation—like oil droplets forming in water—is crucial for establishing domains of silenced and active gene expression. These discoveries are revising our understanding of how our genome readout generates ourselves. There are tens of thousands of recently uncovered disease-associated DNA sequence changes that occur outside the genes. In order to intervene and develop treatments, we need a much better understanding of how these changes affect gene regulation. There are some mechanisms that have been identified thus far, and many new mechanisms likely remain to be discovered. You’ve contributed your expertise in functional genomics to a variety of collaborations with other research groups—including one led by another Rita Allen Foundation Scholar. Can you tell us about some of your collaborations? Ted Price [a 2009 Rita Allen Foundation Scholar] and I have been working together since I’ve been here. It’s kind of a coincidence that we’re both Rita Allen Scholars and ended up at UT Dallas. There’s some exciting things coming … it’s still a little premature, but we’re looking for control elements that impact pain. We’re using genomic techniques to address pain beyond the proteome and genes that are usually implicated in this type of work. And we’re using both mouse and human systems. Collaborations are definitely something difficult to establish with strangers, because I think that trust is the main driver determining the success of collaboration. But I do collaborate quite widely—I have friends across different fields. I did one of the first ChIP-on-chip studies in bacteria through a collaboration to map genomic regions bound by a transcriptional regulator in a clinically important species, Pseudomonas aeruginosa. Most recently, we co-authored a manuscript resulting from a long-standing collaborative genomic study to elucidate the transcriptional complexity of mouse models of Rett Syndrome, an inherited neurological disorder. It’s been very fruitful. What new tools and developments are going to shape the future of research in genomics and gene regulation? First, I’m excited about working toward more computational approaches. I think artificial intelligence is going to really help what we do in terms of data analysis, and figuring out the underlying mechanisms of the biology. It might be too complex for our language and our human minds to process. So we’re trying to apply AI and deep learning, because we deal with a lot of complex genomic data. The second area is imaging, which we don’t have too much experience with, but we’re trying to build collaborations and we’re also bringing expertise in-house. I think moving away from these static, super-resolution images into movies that show the molecular details will be fantastic. I see my field being affected a lot more through these advances than through genomic techniques. Genomics has driven the development of new paradigms over the last decade, but I think imaging is going to help bring more mechanistic details to our understanding of what goes on inside the nucleus.